With Single Sign On (SSO), existing Skillz users can log in with your app without having to enter their username and password. This Single Sign On feature will require you to configure your application in order for it to work. Single Sign-On is already built into our Android SDK and will not require any additional configuration. Start by going to Apple’s iOS DevCenter and logging in. On the next page, choose identifiers. This brings you to all of your App ID’s. Edit the app ID for your game and enable Associated Domains. Important: when making changes to your App ID settings, you’ll need to update all your application’s provisioning profiles. 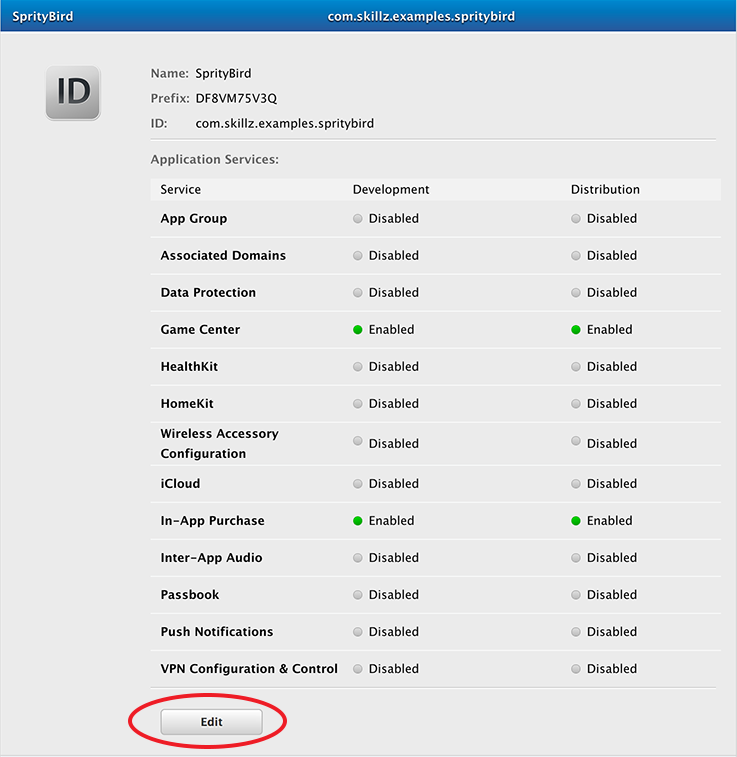 Important: take note of your app ID and Prefix at the top of the dialog; you will need it in Step 3. After adding a certificate, the effected profiles in the Provisioning Profiles section will be marked as invalid. Hit edit and generate to recreate the provisioning profile. You will also need to update your XCode project settings with the newly regenerated provisioning profile. Later, when you create the binary for distribution, you will need to ensure that it uses the correct profile. 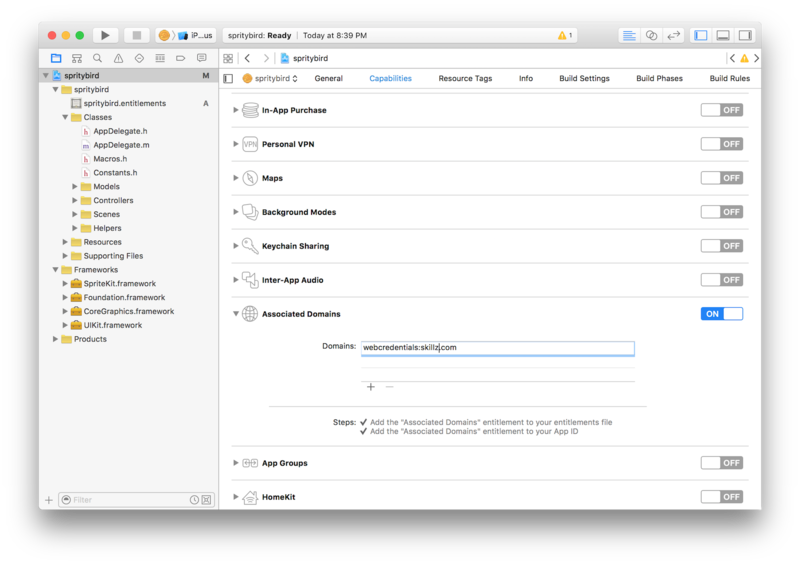 Once you have an updated provisioning profile in your Xcode project your next step will be to configure the Associated Domain in your Xcode project. Open your project configuration by double clicking your project root, then select your project’s target and click Capabilities. If you see a “fix this issue” button in the Associated Domain section, press the button and XCode will make sure the app is configured properly. Add webcredentials:skillz.com to the list of urls under Associated Domains. Existing Games -To enable SSO in a current game, navigate to the Single Sign On screen within your game's edit section of the DevConsole dashboard. On this screen you’ll be prompted to enter your apple app ID prefix. When you’re finished entering it, you will click “Verify” and our integrations team will then enable SSO for your Skillz game within 2-3 Business Days. New Games - To enable SSO in a new game, navigate to the SSO screen within the integration flow. On this screen you’ll be prompted to enter your apple app ID prefix. When you’re finished entering it, you will click “Verify” and our integrations team will then enable SSO for your Skillz game within 2-3 Business Days. If needed, log out of your game. Download Diamond Strike, or another Skillz game, from the App Store. Log in to Skillz in the game from Step 2. Load up your game; you should now be logged back in. Since Diamond Strike will be running in Production, not Sandbox, you will have to use a Production build of your game to test this. Keep in mind that Production builds have to be uploaded in the Developer Wizard before they will work.